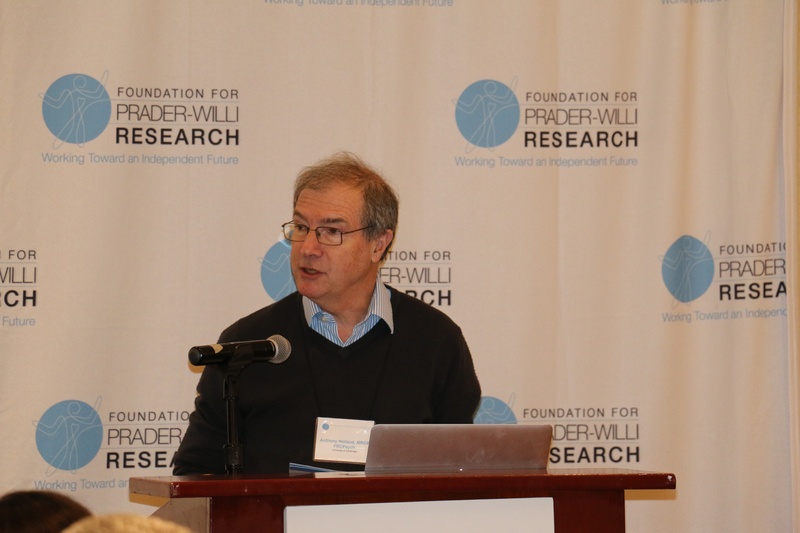 On March 1-3, 2015, approximately 45 top mental health professionals from around the world gathered in Bethesda, Maryland to discuss behavior and mental health in Prader-Willi syndrome (PWS). Slightly more than half of the group were experienced PWS clinicians or scientists, while the remainder had expertise in mental health research for other neurodevelopmental disorders. The goal of the meeting was to develop a research strategy to advance the science of mental health in PWS. Mental health and behavioral problems remain a major challenge for individuals with the syndrome and their families and caretakers, with significant impacts on quality of life. Workshop participants sought to identify and prioritize key research questions, as well as highlight current opportunities and needs. Recommendations were made with respect to resource development, collaborative opportunities, and targeted research initiatives. An evening reception on Sunday March 1st kicked off the Workshop. Weather was a factor during the day, delaying or complicating travel for many participants. But, with the tenacity and perseverance fitting of a meeting about PWS, the vast majority of attendees made their way to the conference site by Sunday evening. Sunday’s reception included a welcome from Elisabeth Dykens, Director of the Vanderbilt Kennedy Center and Co-Director of the Vanderbilt University Center for Excellence in Developmental Disabilities. Dr. Dykens described her personal motivation in working with people with PWS, and stated that “if you study PWS, you learn about everything!”, highlighting the breadth of PWS symptoms. Dr. Dykens went on to talk about how PWS is a useful model for studying mental health and the underlying biological condition, which could help scientists understand more common conditions, thus increasing the generalizability of the results of PWS research studies. Another highlight of the evening was a talk by Lauren Schwartz-Roth, mom to fifteen-year-old Emma, past president of FPWR and Clinical Psychologist at University of Washington. Dr. Schwartz-Roth talked about the behavioral complexities of people with PWS, and the challenges in helping them navigate through life. She set the tone for the workshop by providing a powerful account of the urgency and importance of its focus topic. Finally, the reception featured “work in progress” poster presentations by several meeting participants. Topics included PWS learning strengths and challenges, behavioral issues and interventions, responses to medications, imaging, and neurobiology. The abstracts from the poster session are available for download, below. The morning session on Monday, March 2nd, was entitled “Setting the Stage: Needs & Opportunities". 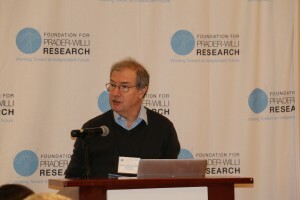 Professor Tony Holland (Health Foundation Chair and Professor, Department of Psychiatry, University of Cambridge, and long time PWS researcher) provided a keynote presentation on the “state of the field” regarding mental health research in PWS, emphasizing areas of need and opportunity. His talk, entitled “From Characterizing Behaviours to Understanding Mechanisms: Investigating Interventions for the Problem Behaviours and Mental Ill-Health Associated with PWS” provided an overview of the typical features of PWS over the lifespan. He described overeating in PWS as likely being fundamentally neuro-behavioral rather than metabolic in origin, but also described alternative theories (e.g., a response to negative energy balance in utero). 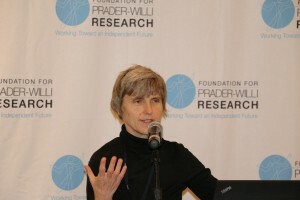 Dr. Holland then reviewed the behavioral characteristics of PWS and the susceptibility to mental illness, including differences in psychiatric illness according to genetic subtype – with those having PWS by UPD being more susceptible to psychosis and those with PWS by deletion more susceptible to depression. He emphasized some of the more challenging behavioral characteristics, including temper outbursts and repetitive and ritualistic behavior. In all of these cases, he reviewed the current limited data regarding potential underlying reasons for these behavioral and psychiatric problems, and pointed out promising avenues of study. One area of interest for Dr. Holland is the role of the autonomic nervous system (ANS) in behavioral difficulties. Finally, Dr. Holland touched on some of the new possible interventions that might help mitigate behavioral and psychiatric problems in PWS, including N-acetylcysteine (NAC) for skin picking, oxytocin, and vagal nerve stimulation for anxiety and behavioral challenges. Finally, he emphasized that although the risk of psychosis in PWS is stressful for families, it should be noted that individuals with PWS generally respond well to medication for this problem, and frequently return to their previous level of functioning. Dr. Holland also provided a written overview of the mental health issues in PWS for the workshop program, which can be downloaded below. Dr. Holland’s overview of PWS was followed by presentations from experts in related fields of mental health / developmental disability research. The goal of these talks was to identify how research in these related areas dovetail with PWS, and how one might apply this knowledge towards new ways of conceptualizing and addressing mental health in PWS. Tony Simon, Ph.D., from the MIND Institute and Professor, Department of Psychiatry, University of California, Davis, gave a presentation about another genetic syndrome associated with mental health difficulties, 22q11.2 deletion syndrome. In his talk, “Cognitive-Affective Interactions and Psychosis Risk (and Protection? ): The Case of Chromosome 22q11.2 Deletion Syndrome”, Dr. Simon discussed how children with 22q deletion can be separated into 2 groups based on their level of anxiety– those who manage anxiety well, termed “copers” and those battling higher anxiety, termed “strugglers”. Interestingly, his research has found that being a coper or struggler is independent of IQ. Copers do better than strugglers in real world functioning and may outperform expectations based on cognitive testing alone, while the opposite is true for stugglers. Dr. Simon discussed the concept of “allostatic load”, which is important in his model of “copers and strugglers”. Increased allostatic load occurs when a person is exposed to repeated and chronic stress, and it contributes to whether someone is a “coper” or “struggler”. Allostatic load is correlated with psychiatric difficulties in many populations, including 22q. He talked about “copers” and “strugglers” in terms of their risk for mental illness, and highlighted the importance of creating environments to help children become “copers” by speaking to children’s strengths and decreasing stress (ie, reducing their allostatic load). This may be accomplished with a variety of tools and approaches –employing behavioral therapy, establishing an appropriate and supportive educational environment, using medication if needed, providing support for families to improve coping strategies, and helping parents set realistic expectations. Dr. Simon’s talk piqued interest in determining whether the anxiety/coper/struggler paradigm also applies to PWS. The next talk was given by Stephen Porges, Ph.D. from the University of North Carolina, Chapel Hill and was entitled: “The Polyvagaltheory and Autonomic Nervous System Function: Implications for the Understanding of the Behavioral Phenotype of PWS”. Dr. Porges reviewed autonomic nervous system function and described how the “polyvagal theory” may have implications for understanding behavioral issues in PWS. The polyvagal theory is focused on the flight, fight or freeze responses to a real or imagined threat. This is a very interesting new area to consider and warrants further research in terms of how this theory might help explain some of the behavioral challenges and psychological issues seen in individuals with PWS. The final talk of the morning was given by Elizabeth Berry Kravis, MD., Ph.D., Professor at the Rush University Medical Center. Dr. Berry-Kravis is an expert in performing clinical trials to evaluate drugs that may improve behavior and cognitive ability in persons with Fragile X syndrome (FXS). Dr. Berry-Kravis discussed “Outcome Measures for Treatment Trials in Fragile X Syndrome: Hurdles, Lessons and Progress”. She shared the experience of the FXS research community on measuring endpoints and outcomes, detailing what has and has not worked for their clinical studies, and suggesting how to successfully adapt the measures to PWS treatment studies. Taking the time to develop the appropriate measures will be critical and will require intense collaboration among researchers, caregivers and clinical teams. The Global PWS Registry should provide an excellent resource to collect data to inform endpoint development. The morning talks energized the workshop attendees and prompted discussions during lunch on new ways to conceptualize, investigate and improve mental health in those with PWS. The afternoon session on Monday, March 2nd was entitled “Identification of Key Issues and Research Priorities” The session kicked off with a highly engaging and provocative session entitled “Can We Prevent or Mitigate Psychosis in PWS?” The session was moderated by Dr. Tony Holland, who summarized what is known about the onset of psychosis in PWS. The question was then put to the group, “should a clinical trial be performed to try to prevent the onset or recurrence of psychosis in PWS?” If so, what should the intervention be? (psychiatric medication, omega-fatty acids, a non-pharmacological intervention), what ethical issues need to be addressed, and how would such a trial be conducted? After a thoughtful discussion, a general consensus was reached that it was not yet time to embark on such a clinical study. However, there was strong consensus that current efforts should focus on better identifying those at highest risk for developing psychiatric disease. Also, specifically characterizing the “prodromal” symptoms of psychiatric illness in PWS – those very early symptoms that often precede an impending psychiatric event, was prioritized. Finally, determining the underlying cause of psychosis might be helpful in designing an optimal clinical clinical trial as well. Various ways of approaching such studies were also discussed. The rest of the afternoon session was spent in break out groups. Workshop participants were each assigned to one of several moderated working group sessions focused on a series of pressing mental health challenge in PWS, as previously identified by researchers and parents. The discussion session topics included depression/mood issues, anxiety/OCD, temper outbursts, social challenges and further developing the research infrastructure for PWS mental health research. Everyone participated in two of these sessions during the afternoon program, and participants developed strategic recommendations for future study. The moderators of each group then synthesized the discussion into a brief summary and presentation to share with the entire workshop audience during the next day’s session. A group dinner at Trattoria Sorrento (yum!) Monday evening provided a wonderful venue for continuation of the discussions started during the day. Morning and afternoon sessions on Tuesday, March 3rd - The final day of the workshop started with "The Oxytocin Conundrum". There was a fascinating overview of the research on the biology of oxytocin by long time expert in the area, Sue Carter, PhD. Director of the Kinsey Institute and Biology Professor at Indiana University. A lively group discussion followed, focused on possible new ways of understanding how the oxytocin and vasopressin systems may be disrupted in PWS. Discussions of key questions to address in future research were highlighted (e.g., examining deficits in long acting oxytocin system and resultant effects on vasopressin receptors). Next, moderators from the previous day’s working groups presented summaries and recommendations to the entire audience. Over a working lunch and wrap up, Dr. Dykens prompted the group for ‘pearls’ from the workshop and research recommendations to aid in developing next steps for mental health research in PWS. Several important research questions were identified and will form the basis of a full scientific report , currently in development. Some of the key issues identified included the development of effective outcome measures for PWS mental health treatment studies, advancing the neurobiology of underlying mental health and behavioral issues in PWS, and the importance of having longitudinal and natural history data. There was a lot of interest expressed in applying mindfulness strategies to PWS to address temper outbursts and anxiety symptoms. Additionally, many researchers highlighted the need to test current state of the art behavioral interventions for OCD, anxiety, anger outbursts and adapt them specifically to PWS. Workshop attendees expressed a strong interest in further research on oxytocin and vasopressin to test the new model proposed by Dr. Carter, and in developing a study to assess autonomic nervous system function in PWS to see if the polyvagal theory can help explain behavioral issues (particularly temper outbursts and anxiety). Another key research priority was to identify and characterize a prodromal phase to mental illness in PWS, to see if intervening at that stage would minimize symptoms. Effectively disseminating information on PWS “best practices” to families, caregivers and community health care providers was also recognized as an important goal. The Global PWS Registry was felt to be a critical resource to advance mental health research since it will compile data on mental health over the lifespan. Additionally the Registry can facilitate the development of appropriate outcome measures for intervention trials. Involving parents, families and caregivers (both family and professional) at all levels was emphasized by Workshop attendees, as their vast experience and engagement is critical to advancing knowledge and therapy. Finally, the Workshop was an excellent opportunity to strengthen relationships with investigators, key staff and program officers at the National Institutes of Health. Continuing to cultivate these relationships is a key priority moving forward. Strengthening collaboration among the outstanding investigators present at the meeting as well as additional experts in the field will also be important. The recommendations from the Workshop will guide FPWR in developing future mental health research initiatives and funding priorities, and we look forward to advancing the concepts developed at the this meeting. “I wanted to tell you how much I appreciate all your hard work into making this conference happen. I loved every minute of it and came away feeling excited and energized about the work." “This workshop was amazing. I met so many of my own heroes and loved hearing their ideas and experiences during the break out groups." The Workshop was sponsored by the Foundation for Prader-Willi Research (FPWR); FPWR – Canada; and the Colorado Chapter of the Prader-Willi Syndrome Association (USA).